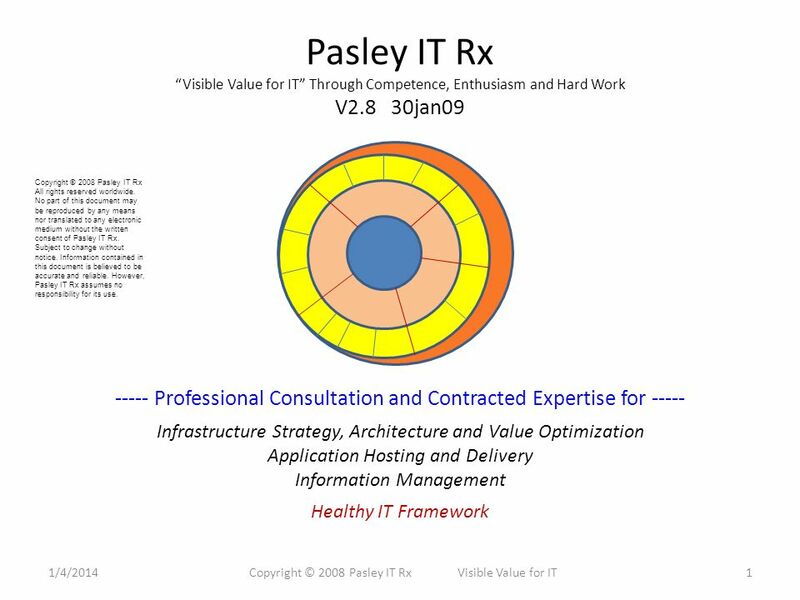 Pasley IT Rx Visible Value for IT Through Competence, Enthusiasm and Hard Work V2.8 30jan09 1/4/20141Copyright © 2008 Pasley IT Rx Visible Value for IT. 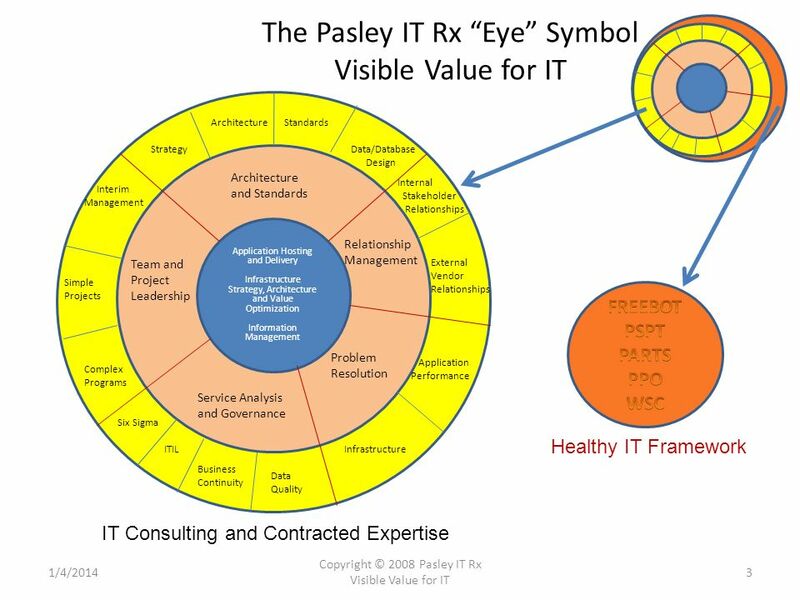 1 Pasley IT Rx Visible Value for IT Through Competence, Enthusiasm and Hard Work V2.8 30jan09 1/4/20141Copyright © 2008 Pasley IT Rx Visible Value for IT ----- Professional Consultation and Contracted Expertise for ----- Infrastructure Strategy, Architecture and Value Optimization Application Hosting and Delivery Information Management Healthy IT Framework Copyright © 2008 Pasley IT Rx All rights reserved worldwide. No part of this document may be reproduced by any means nor translated to any electronic medium without the written consent of Pasley IT Rx. Subject to change without notice. Information contained in this document is believed to be accurate and reliable. 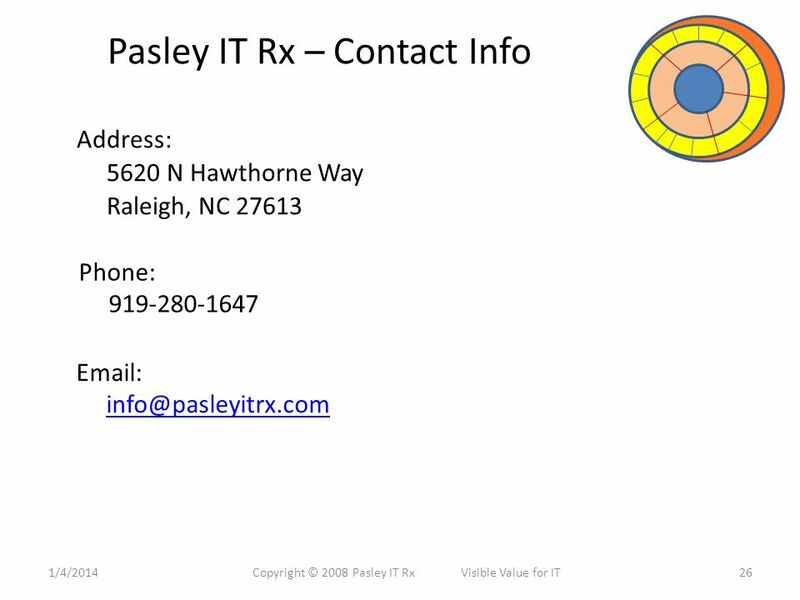 However, Pasley IT Rx assumes no responsibility for its use. 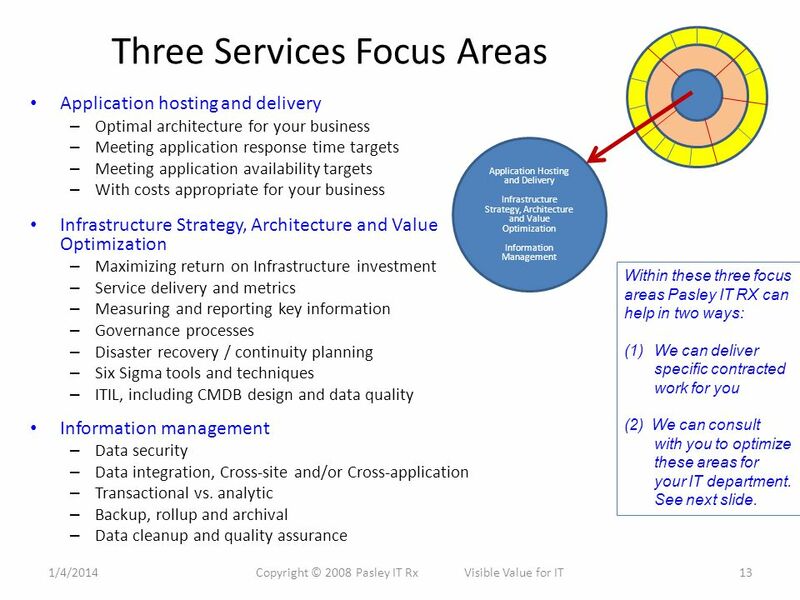 13 Three Services Focus Areas Application hosting and delivery – Optimal architecture for your business – Meeting application response time targets – Meeting application availability targets – With costs appropriate for your business Infrastructure Strategy, Architecture and Value Optimization – Maximizing return on Infrastructure investment – Service delivery and metrics – Measuring and reporting key information – Governance processes – Disaster recovery / continuity planning – Six Sigma tools and techniques – ITIL, including CMDB design and data quality Information management – Data security – Data integration, Cross-site and/or Cross-application – Transactional vs. analytic – Backup, rollup and archival – Data cleanup and quality assurance Application Hosting and Delivery Infrastructure Strategy, Architecture and Value Optimization Information Management 1/4/201413Copyright © 2008 Pasley IT Rx Visible Value for IT Within these three focus areas Pasley IT RX can help in two ways: (1)We can deliver specific contracted work for you (2) We can consult with you to optimize these areas for your IT department. 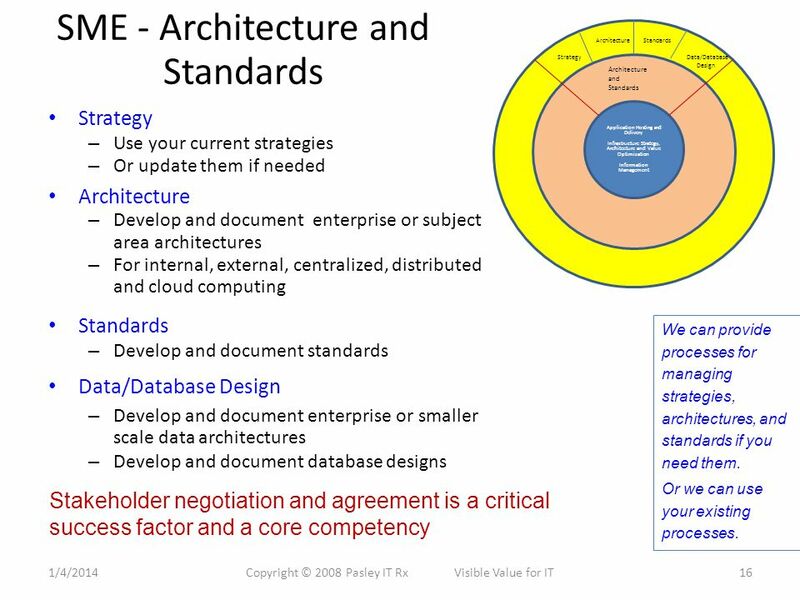 See next slide. 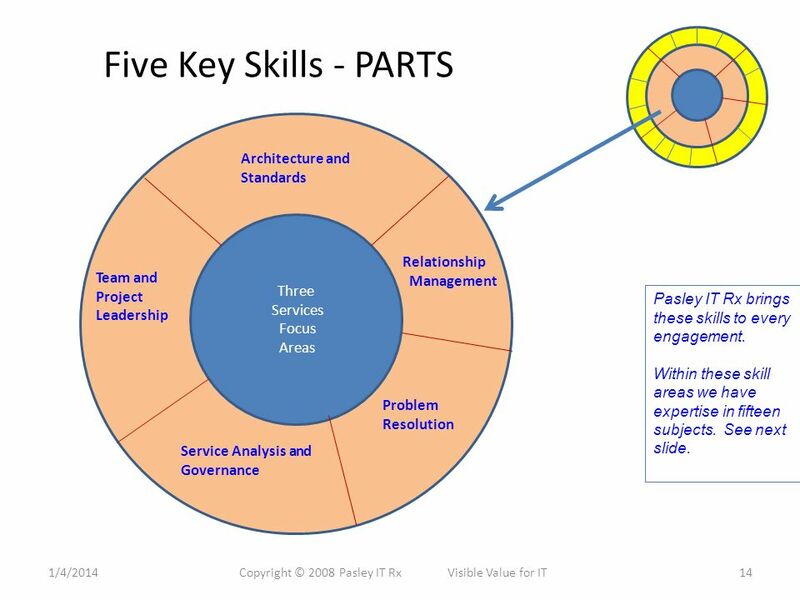 14 Five Key Skills - PARTS Three Services Focus Areas Architecture and Standards Problem Resolution Relationship Management Service Analysis and Governance Team and Project Leadership 1/4/201414Copyright © 2008 Pasley IT Rx Visible Value for IT Pasley IT Rx brings these skills to every engagement. 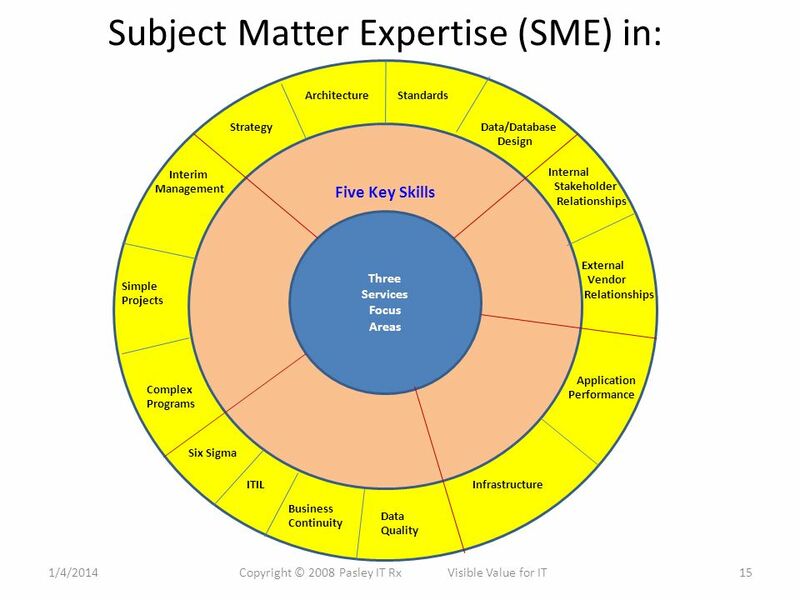 Within these skill areas we have expertise in fifteen subjects. 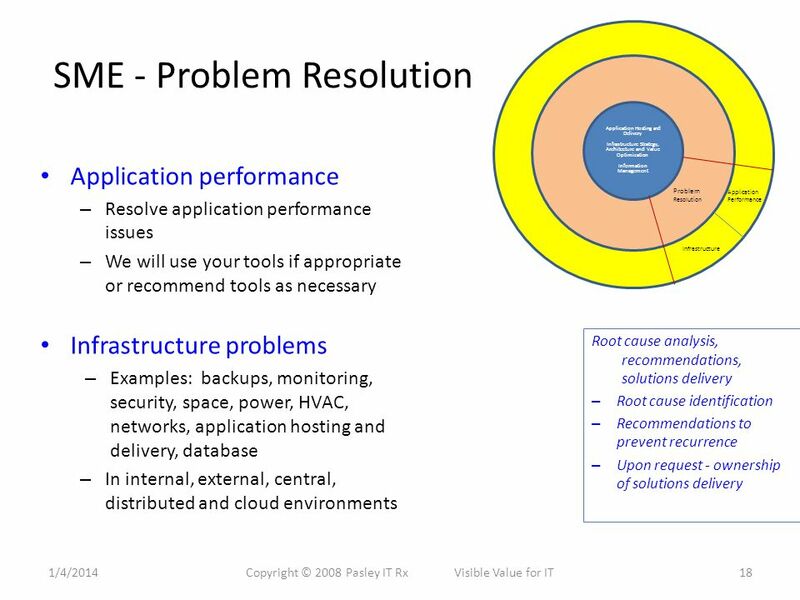 See next slide. 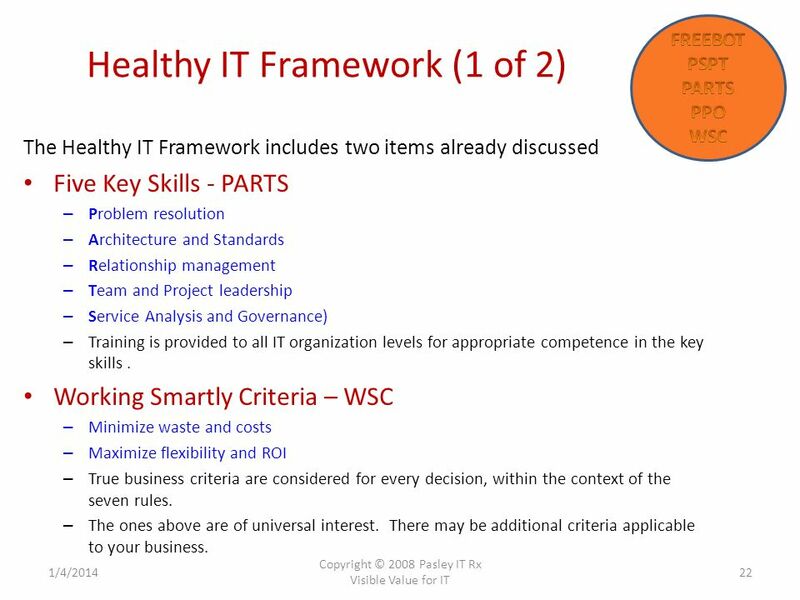 22 Healthy IT Framework (1 of 2) 1/4/2014 Copyright © 2008 Pasley IT Rx Visible Value for IT 22 The Healthy IT Framework includes two items already discussed Five Key Skills - PARTS – Problem resolution – Architecture and Standards – Relationship management – Team and Project leadership – Service Analysis and Governance) – Training is provided to all IT organization levels for appropriate competence in the key skills. 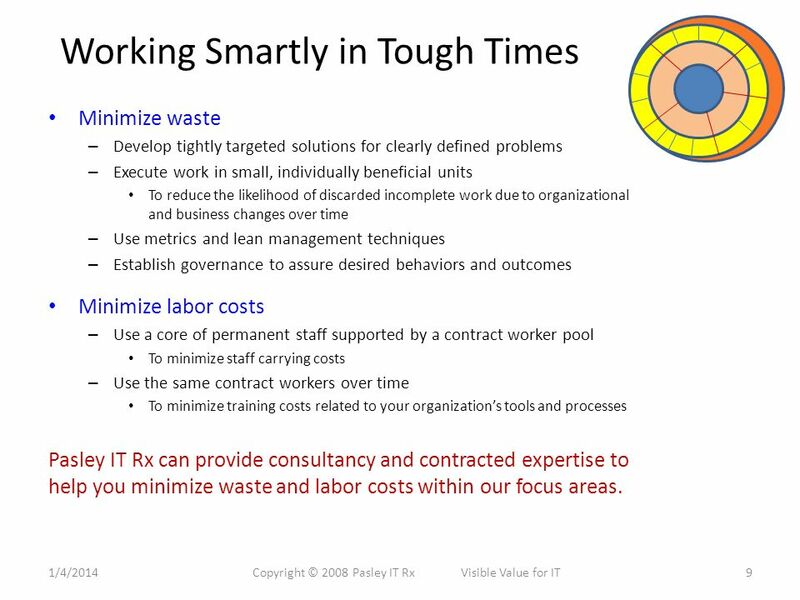 Working Smartly Criteria – WSC – Minimize waste and costs – Maximize flexibility and ROI – True business criteria are considered for every decision, within the context of the seven rules. – The ones above are of universal interest. 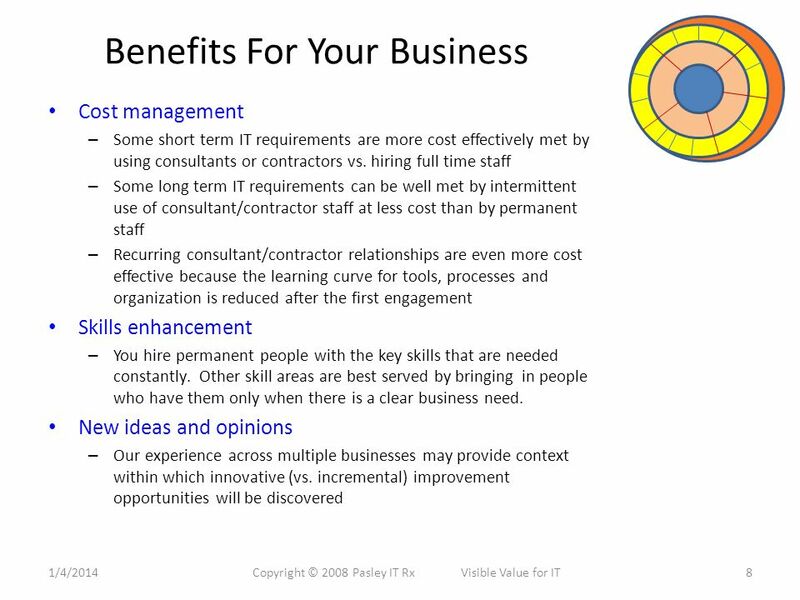 There may be additional criteria applicable to your business. 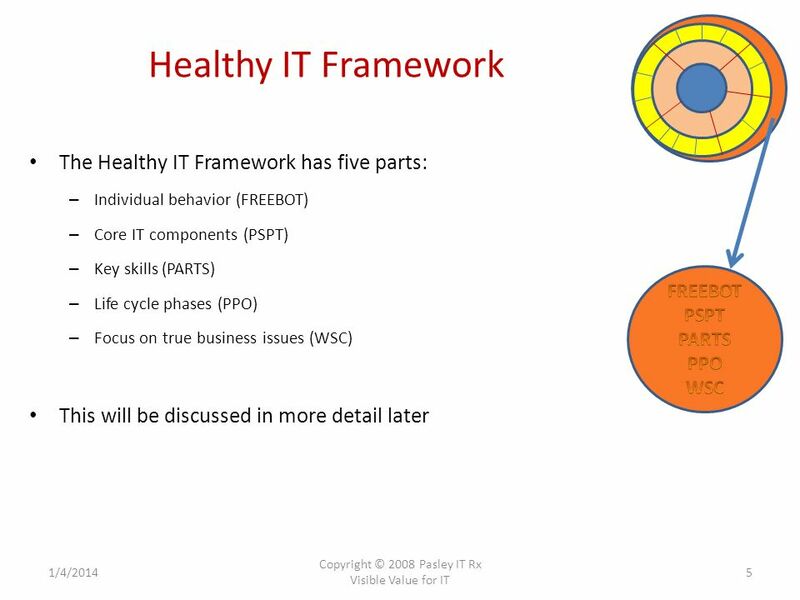 23 Healthy IT Framework (2 of 2) 1/4/2014 Copyright © 2008 Pasley IT Rx Visible Value for IT 23 Plus three other items: Seven Rules for behavior - FREEBOT – Freedom, Respect, Ecology, Enterprise, Boundaries, Opportunity, Truth – The rules are understood and honored by all stakeholders. Ethical and consistent behavior by the people involved is the foundation for culture building. 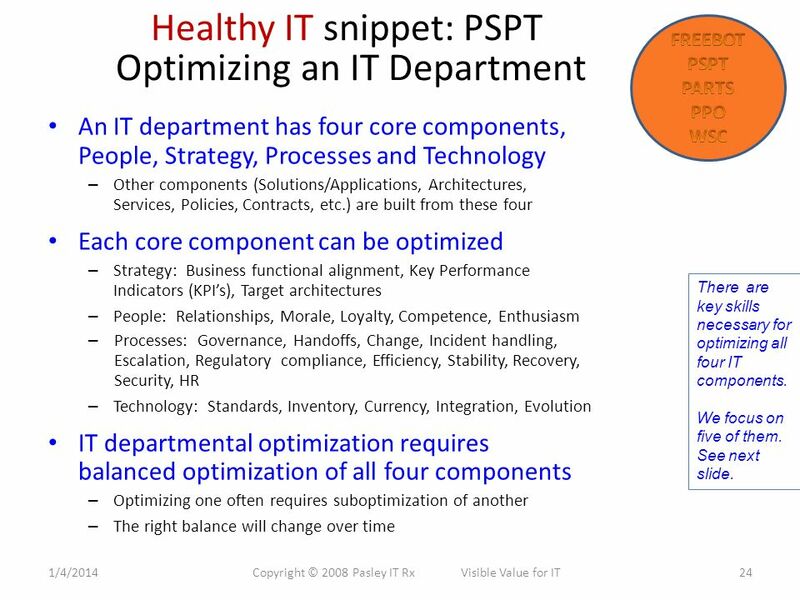 Four Core Components of IT – PSPT – People, Strategy, Processes, Technology – The PSPT components are clearly understood, consistently implemented, and revised at a pace that meets the pace of change for the business. 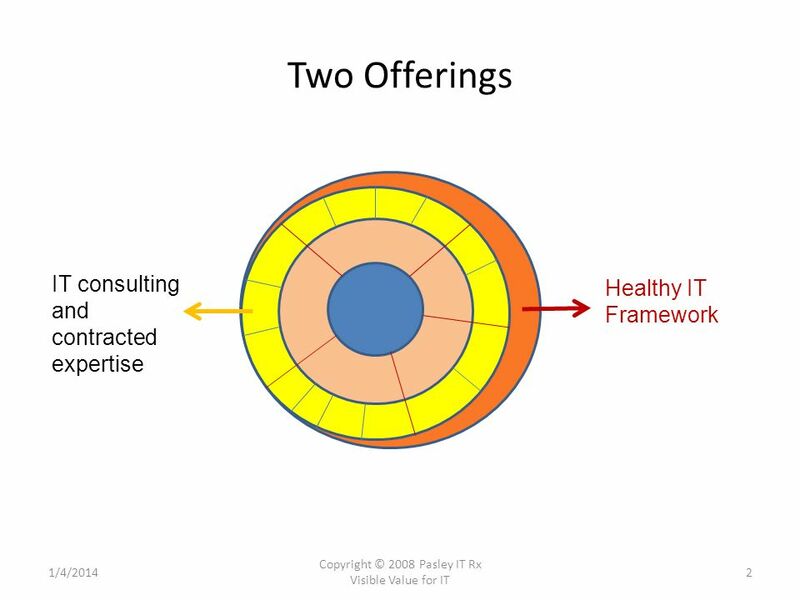 – Appropriate balance is maintained between them for focus, funding, talent, etc. 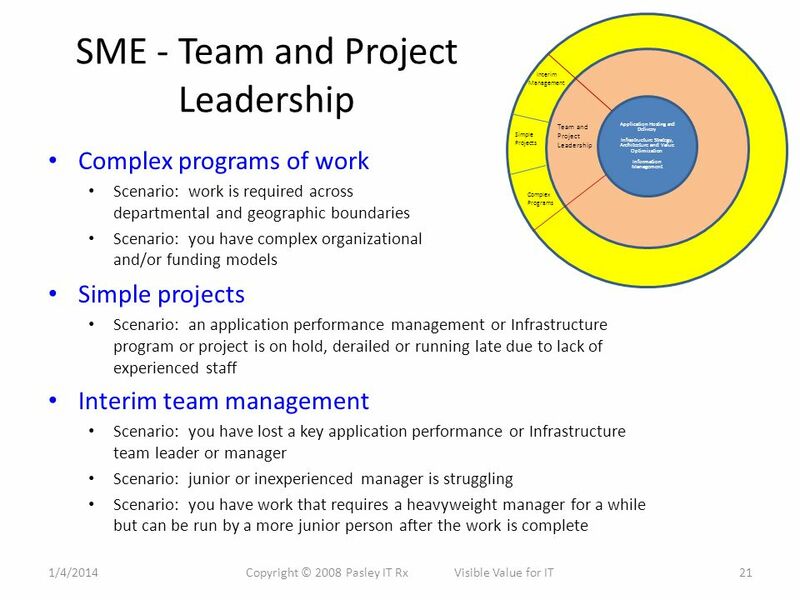 Three Life Cycle Phases – PPO – Planning, Projects, Operations – Each phase has competent and committed leadership. 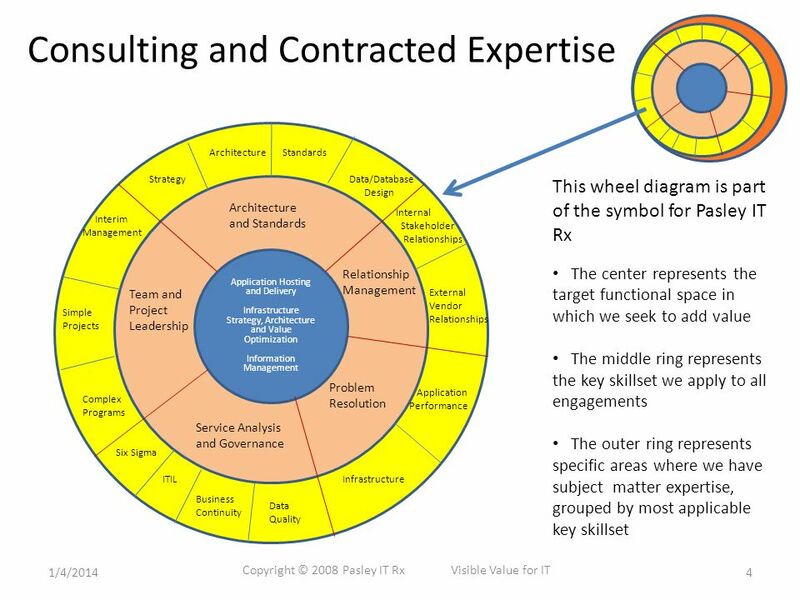 – The leaders communicate with one another and produce work that is synergistic and coordinated across the three phases. 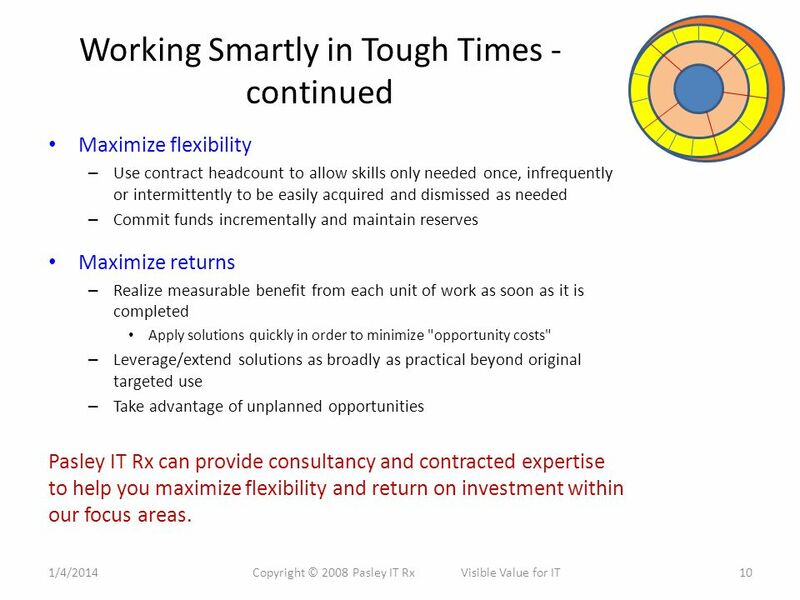 – Appropriate balance is maintained between them for focus, funding, talent, etc. 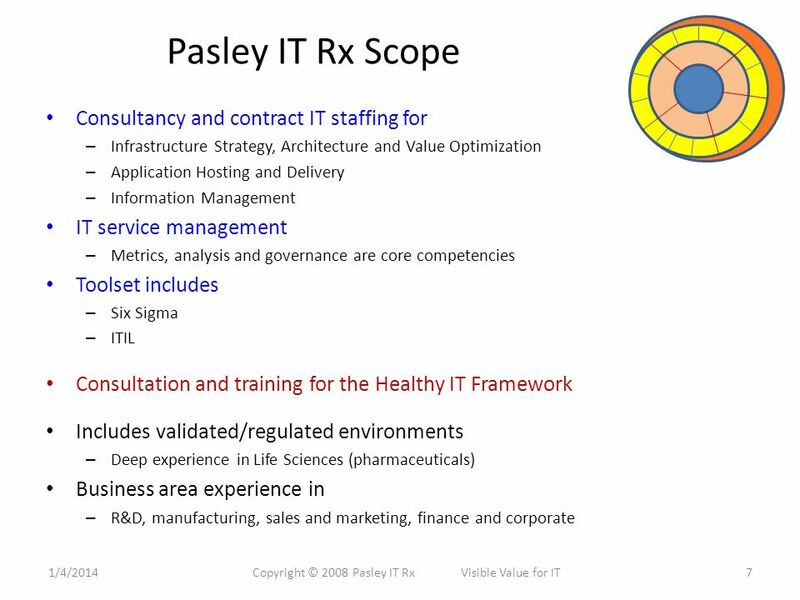 Download ppt "Pasley IT Rx Visible Value for IT Through Competence, Enthusiasm and Hard Work V2.8 30jan09 1/4/20141Copyright © 2008 Pasley IT Rx Visible Value for IT." 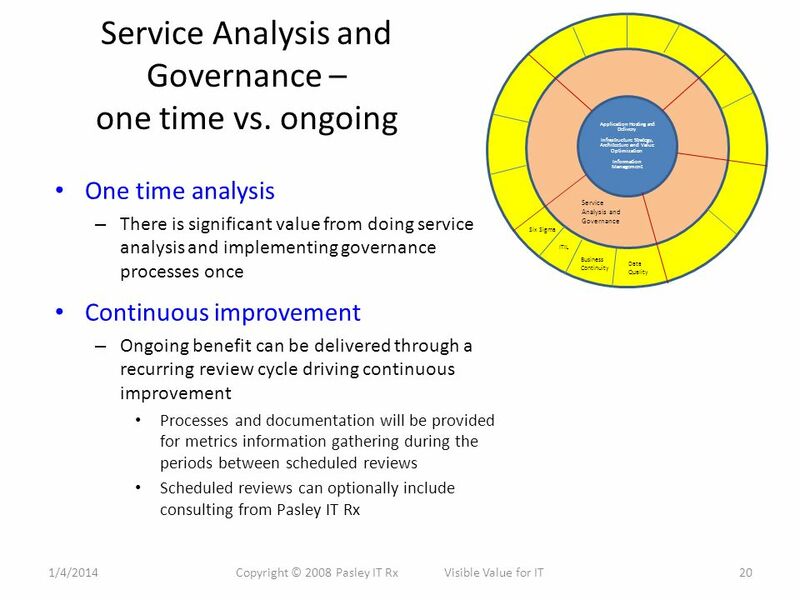 Dr. Peter OReilly Chairperson- ISM Services Group /23/20141 NAPM-AZ Presentation- March 2009. Welcome to Site Management Amy Thompson. Agenda I.Foundation Introductions Setting the Session Agenda II.Site Management Principles III.Site Management. 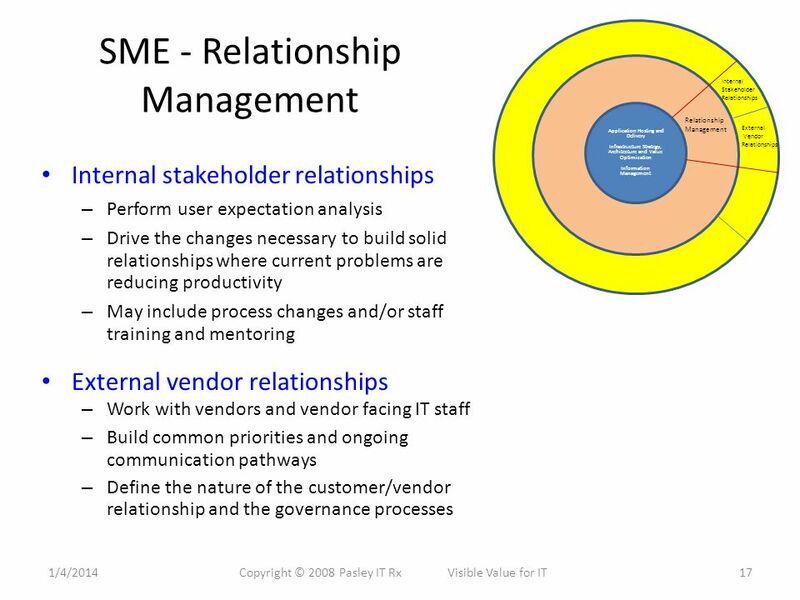 10/6/20141 The PeopleSide of Change Agenda Why is the People Side of Change Important Components of a Successful Change Program How We Get There. Delivery Business Solutions April 29, Nashville PMI Symposium April 29, 2013 Stephanie Dedmon, PMP Director, Business Solutions Delivery Department. 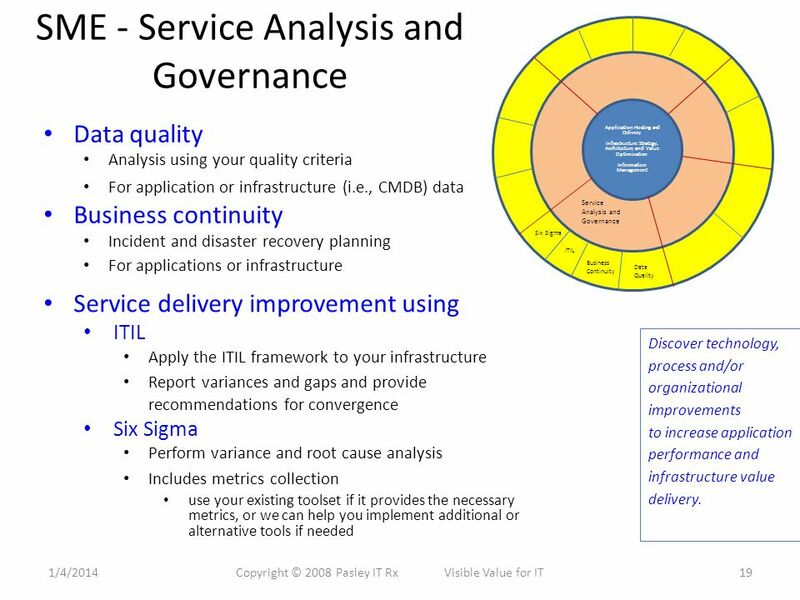 Improving Your Business Results Six Sigma Qualtec Six Sigma Qualtec Six Sigma Qualtec – All Rights Reserved June 26, 2002 BEYOND SIX SIGMA: A HOLISTIC. 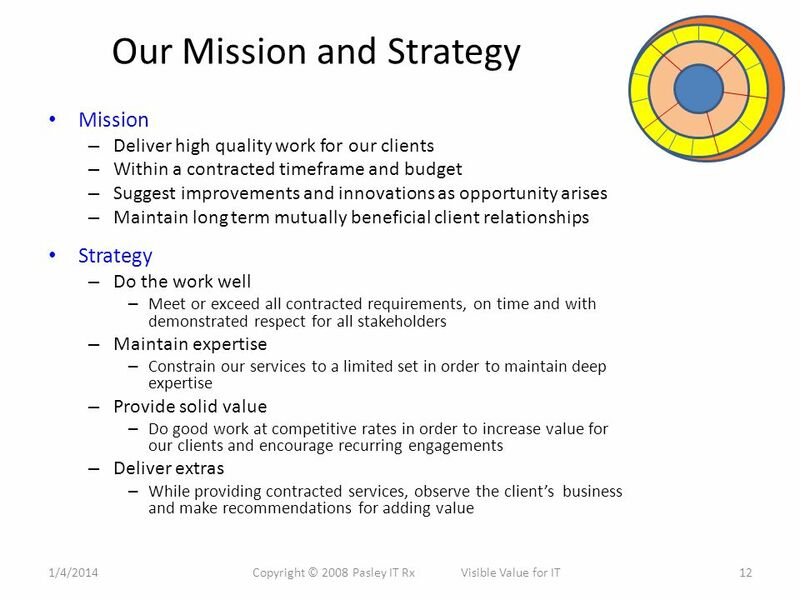 V i s i o n ACCOMPLISHED ™ Portfolio Management Breakthroughs Shelley Gaddie President Project Corps Pacific Northwest Portfolio Management Roundtable. 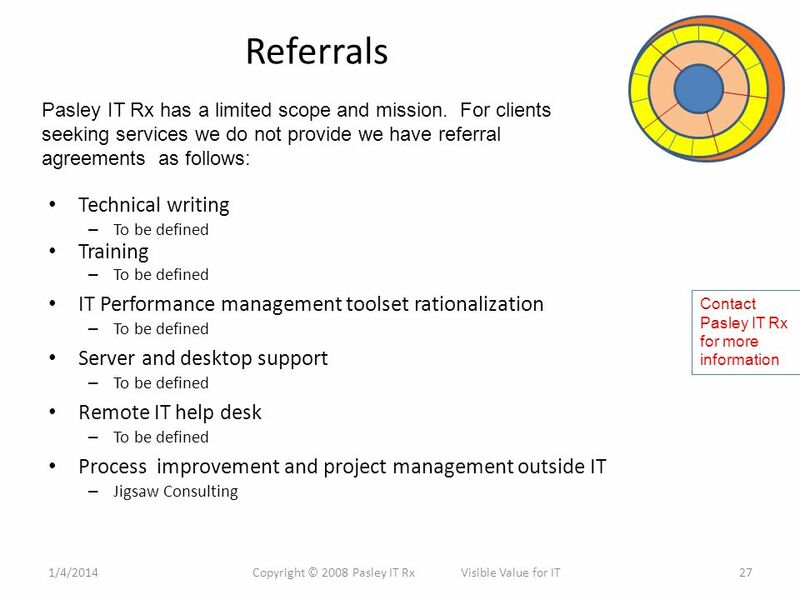 Lesson 10 IT Project & Program Management. 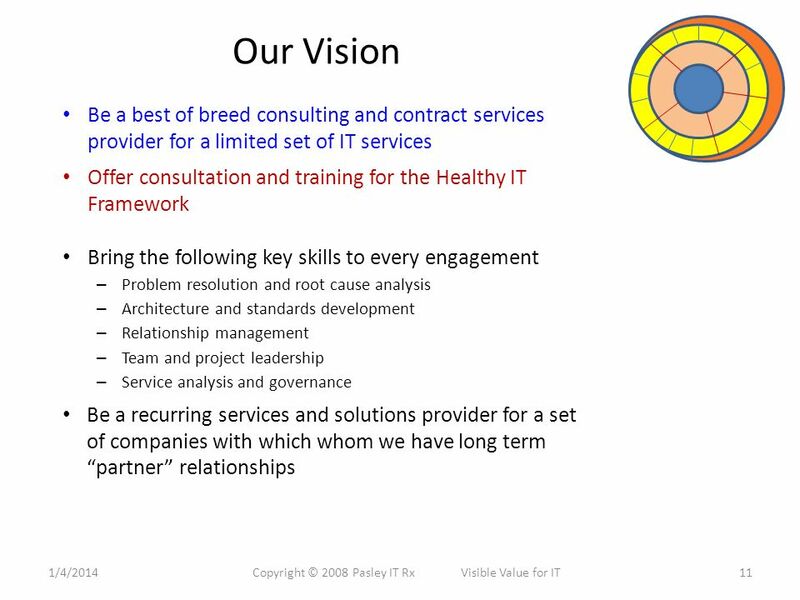 Viewpoint Consulting – Committed to your success. 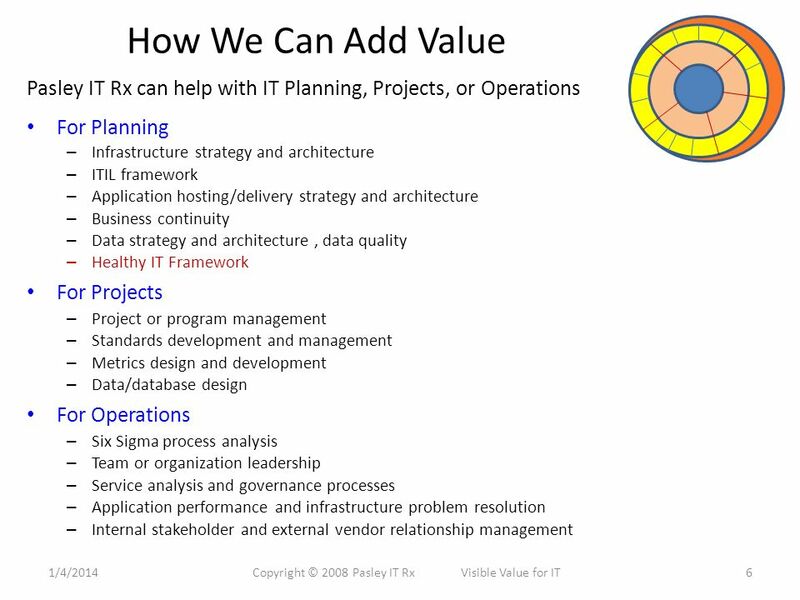 1 Chapter 12 Planning for Electronic Business: Resource and Implementation Issues. Alliance for Strategic Technology (AST) SUNY Business Intelligence Initiative January 8, 2009.